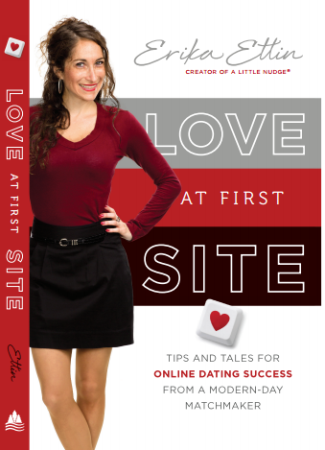 In Love at First Site, dating coach Erika Ettin has taken her expertise—previously only available to her clients—and laid it out in an easy-to-use and exciting guide to the world of online dating. Erika shows her readers how to increase their odds for connections by marketing themselves well. Her background in economics helps her use the numbers game in her favor. It’s a simple equation: more profile views equal more dates, more dates equal a better chance at finding your match. With her tips and tricks, Erika can show you exactly how to increase your online dating odds. Erika’s advice includes pointers for choosing your best profile picture, writing a winning profile, crafting emails that catch someone’s attention, and planning the first date. Erika’s knowledge is rooted in her highly successful coaching business as well as her own experience with online dating. Questions from Erika’s clients will save you the time of wondering how to approach strange situations—they’re all in here! And tales of dating adventures from Erika herself will leave you both encouraged and entertained. Click here to read Chapter 1 for FREE.